Protesters from First Nations communities gathered near the mountain Saturday, Nov. 25, 2017. The Mining Association of Nova Scotia hopes to develop a quarry in the area of Kellys mountain in Cape Breton, but the Mi’kmaq say the land is sacred. The picturesque landscape is covered by the Kluscap wilderness and considered First Nation's holy ground, but the association believes there’s an aggregate deposit of over 2 billion tonnes on the mountain in New Harris, N.S. Protesters from First Nations communities gathered near the mountain to take a stand against any mining or quarrying on the land Saturday. Executive director for the mining association, Sean Kirby says construction of a quarry could potentially employ dozens. He says the association agrees with the basic objectives of the protected area’s plan, but believes there can be a better balance between the environment and the economy. 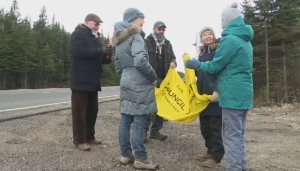 Johnanna Padelt from the Inverness Chapter Council of Canada says it’s not the first time the idea of mining or quarrying on Kelly’s Mountain has been discussed. She was part of a group protesting against a company called Kelly Rock Ltd., in the late 1980's. “Here we are almost 30 years later and were having the potential of facing the same thing again, the difference now being that this land has been recognized officially as First Nations sacred land,” says Padelt. According to the mining association, Cape Breton is being harmed by the provincial government’s Parks and Protected Areas Plan and it’s affecting dozens of projects and jobs. Kirby says the potential aggregate deposit is quite small and involves less than one percent of the mountain. He says the government should considering swapping nearby land to satisfy both sides. “It's a good distance from, at least three kiolmetres from one site we know is concern of the Mi’kmaq so well outside the zone of impact,” says Kirby. Protesters told CTV News they will be rallying together again Sunday. How do you feel about the federal and Nova Scotia governments spending $100 million on a new art gallery? I’m for it. Government should invest in the arts. I support a new art gallery, but that’s too much money. I’m against it. Nova Scotia doesn’t need a new art gallery.